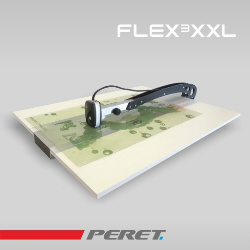 The FLEX³XXL-PRO is the large format version of the FLEX³PRO. With an lever extention of more than 70cm there can be measured any place inside a 140cm flexo plate. The FLEX³XXL-PRO can be mounted within between two tables. If you own already a FLEX³PRO you can re-use the sensor head and make a large format version out of your system by buying the FLEX³XXL retrofit system. Measure plate thickness and relief depth using remote control and input data via USB directly into your FLEYEplus reports.